Many folks visit Coin Values asking about the value of their old wheat cents. I think a lot of these visitors believe they've hit the jackpot when they find an old Lincoln wheat cent in circulation and then come here wanting to know whether their 1941 penny is worth either hundreds of dollar or thousands of dollars. How disappointing it must be for some of these folks when I tell them that their old wheat cents are, in most cases, worth just 5 or 10 cents each. But why aren't most of these old coins worth more? Shouldn't an old penny that's 60, 70, 80, or more years old be worth much more than just a few cents? As a lot of new coin collectors learn upon spending more time in the hobby, the value of a coin isn't solely based on its age. In fact, in many cases, age is itself often irrelevant to a coin's value. In general terms, the value of a coin is based on its rarity, condition, intrinsic spot metal value, and the collector demand for a given coin. On the flip side of the token, coins that are very common, well worn, or don't have much demand aren't worth as much. Therefore, common, circulated coins with little collector demand and little bullion value aren't going to draw top dollars. Now, there are at least two things going for those old wheat cents: (A), they are in high demand from coin collectors, and (B) most (except for the 1943 steel cent) contain copper, and copper is worth about twice the face value of the one-cent coin, or two cents. Not too shabby! However, most Lincoln wheat cents were produced by the tens of millions and, in many cases, the hundreds of millions. Yes, I know you're probably not finding 1930s, 1940s, or 1950s pennies in your pocket change every single day, but, believe me, there are more than enough out there to go around among interested collectors. The bulk of these old pennies are safely residing in coin collections and hoards, and they're always hitting the coin dealer marketplace. Go to most any coin shop and you'll probably find hundreds, if not thousands, of wheat cents there. This is where a lot of those old wheat cents are hiding! In other words, most Lincoln wheat cents are common, and thus many are not worth much over face value. Yes, there are some exceptions. Take, for example, the 1909-S VDB Lincoln wheat cent, a popular rarity worth $600 or more. What's the bottom line? 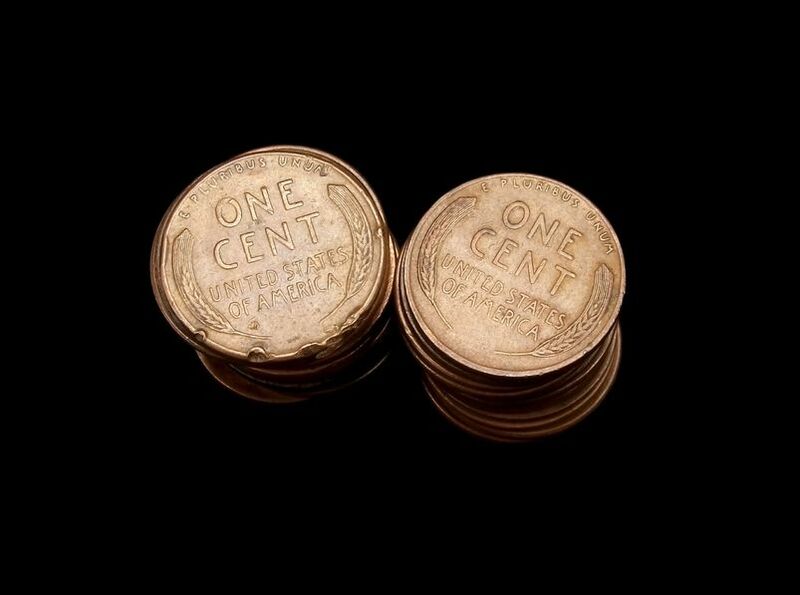 Old wheat cents can be very valuable, and they are definitely popular with coin collectors. Unfortunately, most of the Lincoln wheat pennies you're going to find in circulation are relatively common and thus not all that valuable. Still, that doesn't make them any less fun to find! I keep every Lincoln wheat cent that I've found in circulation. I suggest you do the same, too. After all, they're classic old coins that are ideal for any United States coin collection, and – besides – you never know if these vintage pennies will increase in value someday. Hello, I have a 1943 steel penny that does stick to a magnet and next to it is 1943 and 1944 copper penny (wheat on back). Any of the three worth anything?? 2. What does the coin weigh? It needs to weigh around 3 grams to be copper. 3. What is the shape of the "3"? 1943 pennies have a long bottom tail on the "3" in the date.